Shopware is known to be one of the most versatile open-source e-Commerce solutions combining cutting-edge technologies with a progressive vision of online shopping. Cart2Cart now supports migration to Shopware, so you can take advantage of all the features offered by this innovative platform to create bright and emotional user experience for your customers. And first-rate Shopware templates will help you immensely to provide an enchanting, modern look and gain the upper hand among the competitors. If you are eager to set up a store within this progressive environment try out our Free Demo migration in order to test it in action personally. 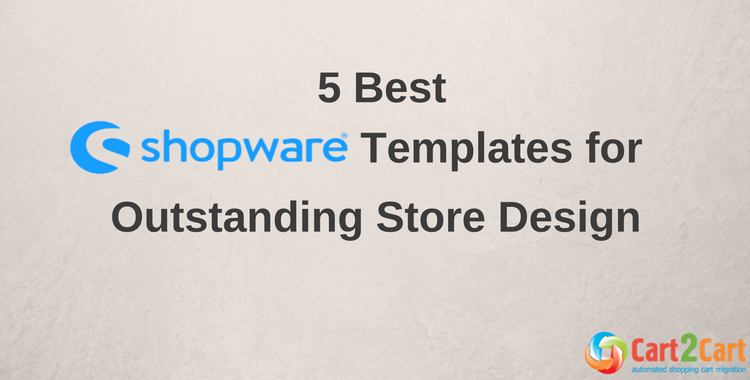 Why Choose Shopware Default Themes? When it comes to choosing a Shopware template for your store you can pick up a default theme and tailor it to your specific needs and tastes. You can also opt for an alternative way and set up a pre-made template. Such ready-to-go Shopware themes can be downloaded both free or paid from the official Shopware marketplace or third-party developer websites. To make a balanced decision take into account all the pros and cons of each variant. Shopware offers two default themes: ‘Responsive’ and ‘Bare’ and they both can be used to develop a unique look of your store and ensure inspiring and appealing customer experience. The ‘Bare’ theme contains only the basic element structure and suits perfectly for creating widely-customised shops. You can use its solid foundation to implement your vision to the full extent. Regarding ‘Responsive’ theme, it offers more possibilities out of the box to compare with the previous one and at the same time it is fully configurable. 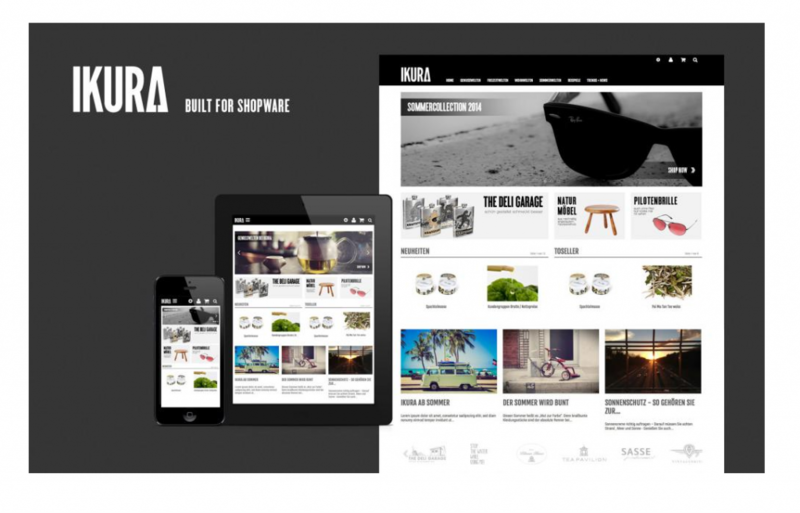 The name of the template stands for itself as it provides excellent omnichannel experience. It is also equipped with some handy features like an off-canvas panel that is a must have things for responsive navigation and infinite scrolling that helps to browse your website more efficiently and list the items without any interruption. Safari, Mac OS X only. The theme is also retina ready and secures top-notch aesthetics by depicting high quality, sharp page and text elements together with vivid and bright pictures due to getting more pixels per square inch. It prevents distortion, pixelation and fonts stretching while zooming and using Apple devices. It is particularly acute for providing smooth cross-device experience, as phone and tablet users often resize web pages for better convenience. Speaking about the overall look of Responsive theme, it can boast clean and modern design that suits perfectly for those who prefer comprehensive uncluttered interface and clear navigation. But the main advantage of ‘Responsive’ default themes, that it is completely customisable. You are given the possibility to create a new theme and add custom styles to it or just modify and extend the default theme with new elements. Everything can be done from the standard backend, especially with a detailed step-by-step guide designed by Shopware developers. But make sure you avoid outdated design elements in order not to spoil the general look of your store. There is a range of efficient tools you are offered to use. For example, Template Inheritance system allows you create a new theme easily by choosing an existing one you want to inherit from and building your own on its basis. When it comes to modifying and adjusting frontend Smarty's block elements facilitate the task immensely. They group interface components into small isolated blocks so that you can edit or even entirely override them in an individual way. Furthermore, you are provided with the possibility to reuse default components to create your own buttons, panels, alert messages and other UI elements in order to develop your custom theme. On Shopware you can choose a template which is specifically structured for your industry type like Home, Fashion. Furniture, Cosmetic, Food, Sport and so on. The decision can also be based on your color preferences and you can opt for Red, Orange, Yellow, Black and Grey, etc. In spite of a variety of themes are available, templates like IKURA, UNI and GREST will always pop up on the list. They are created by TAB10 developer team and share a lot in common, but let’s take a closer look and discover why the won the hearts and minds of Shopware users. IKURA is perhaps the most popular among them. It is responsive and adapts content to mobiles and tablets to let you reap all the benefits of omnichannel e-Commerce. It is also Retina ready and all the web elements always stay sharp and distinct that gives your store an excellent and high-quality look. It comes along with clean and minimalistic design and self-explanatory navigation. The template provides a lot of space for customization to meet your tastes and needs. You are also presented with handy features of the latest Shopware version like new advanced menu, detail gallery, filter function and picture variants. Last, but not the least, developers provide a reliable professional support, so in case you stumble across rough spots, you can easily reach them and ask for a piece of advice. 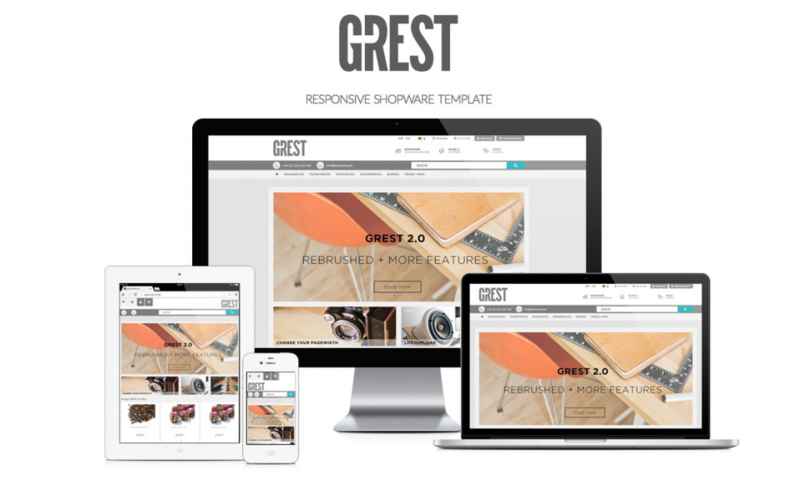 GREST and UNI templates enjoy a wide popularity as well. They are both 100% responsive, retina ready and customizable. Uni offers some optional functions like full-width listing layout, fixed navigation and sharing for article details. It’s important to take into account that GREST template legs a little bit behind, since it doesn’t provide you with a full page width, but allows editing it. All three mentioned templates are based Shopware Community Edition which causes one hiccup like incompatibility with some plugins that are integrated into Professional, Enterprise or Premium Editions. There is a need to make some adaptations to make them work properly within those templates especially when it comes to responsiveness. Another thing that may seem troublesome is the price of those themes since they are among the most expensive and cost almost 400 euros. Developing an outstanding visual appeal is definitely worth every penny spent. Shopware highly flexible and up to date templates provide convincing user experience that ultimately drives your conversion rates. Step aside from the uniformly designed online stores and make online shopping on your website more emotional, diverse and colorful. My interests range from the latest e-Commerce trends to traditional folk culture and adventurous traveling. I always stay open to new ideas and expertise to make my writings handy and captivating for you.